Transfer to a 13-in. x 9-in. baking dish coated with cooking spray. Cover and bake at 375° for 25-30 minutes or until bubbly. Uncover; sprinkle with cheese. Bake 5-8 minutes longer or until cheese is melted. Yield: 10 servings. Preheat the oven to 350F. Place the egg whites, sugar and coconut in a bowel and mix to combine. Press single tablespoons of this macaroon mixture into flat balls and place on baking trays lined with non-stick baking paper. Bake for 10 minutes or until just golden. Cool on the trays. To make the chocolate filling place the cream in a saucepan over medium heat and bring to almost a boil. Remove from the heat, add the chocolate and butter and stir until smooth. Refrigerate until cold and thick. To assemble, spread a macaroon with the chocolate filling and then sandwich with another macaroon. Typically served after dinner with a strong cup of coffee. Serves 16. 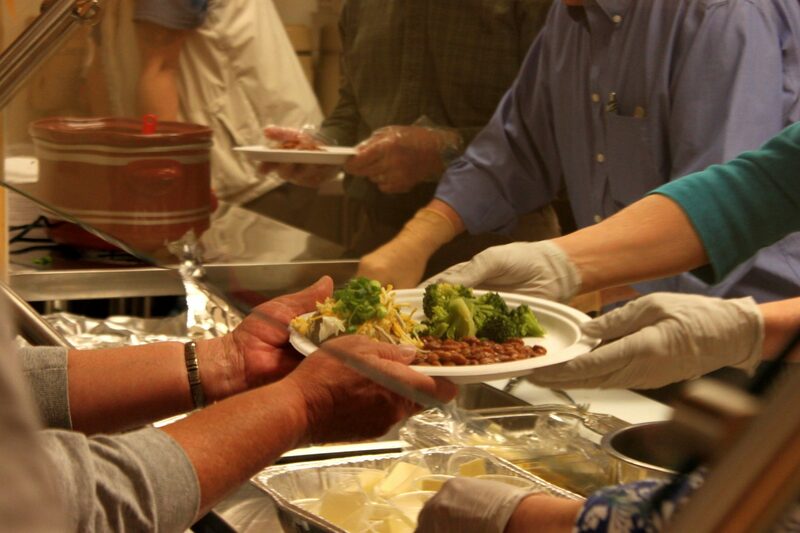 Special thanks to the Nevada County Food Bank and to Interfaith Food Ministries for providing food that helps us provide breakfast and lunch for our guests.